I actually made these quite a while ago but I figure there's no harm in adding them to the blog. I've been a bit sick over the last week so I haven't had a chance to cook, let alone photograph anything. I do remember these being delicious so I think they're worth sharing. There's no harm in sharing things for the past, right? I'm a sucker for coconut and I'm always surprised when I meet people who don't like it as much as I do. I'm not sure what it is about coconut that I find so irresistible but if something has coconut in it, I'm there. I'm also a sucker for chocolate and raspberries despite only having had fresh raspberries a few times in my life. I adore anything with frozen ones in it, so I can only imagine how good fresh ones are! These tarts turned out quite different to the picture in the book, in the book they've sunken and collapsed in on themselves. They look good both ways, so if yours sink it's not a big deal. Cramming the macaroon mixture into the cases was quite hard, I think the tart tins I own are shallower than the ones used in the book but I didn't realise this until after cramming all the mixture in. I'll never quite understand why books don't specify the height of tart tins, so if you're using 2cm (2/3") tart tins you'll probably end up with 7 tarts. You can cram the mixture into 6 tart tins but it's not really worth the effort. If you're using 2.5cm (1") tins you should be fine, though I haven't tried it. Preheat oven to 140°C (280°F). Bake for 25-30 minutes or until macaroon shells are firm and lightly golden. Place the cream and chocolate in a saucepan over a low heat and stir until smooth. Remove from heat and set aside. Place the eggs and sugar in a bowl and beat, using an electric mixer, until light and creamy. Fold in the flour and chocolate mixture. 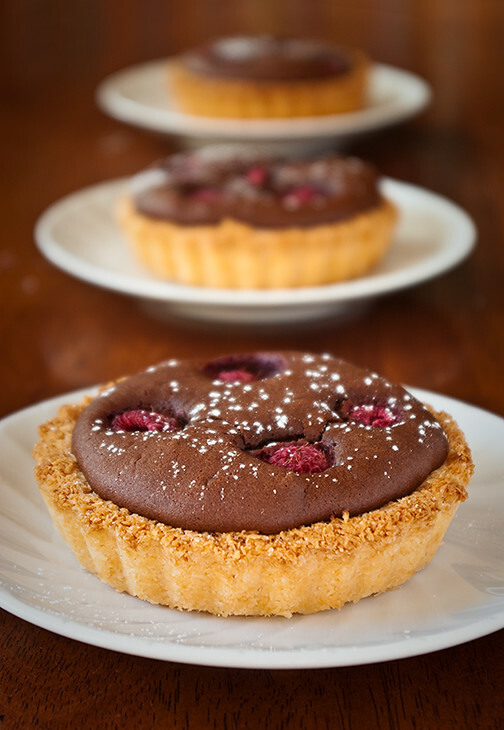 Spoon the chocolate mixture into macaroon shells and top with raspberries. Bake for 25 minutes or until the filling is firm. Cool in tins. thank you! They were quite delicious!